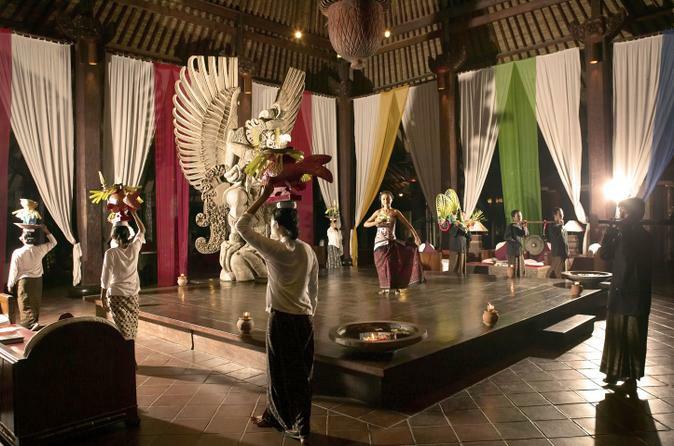 Enjoy a spectacular evening of culture and tradition in Bali. Head to sacred Tanah Lot temple to capture sunset views then step in to the magical world of Tugu Bali. Set amid a remarkable collection of antiques, dine on a lavish spread while being entertained by a traditional theatrical performance. Join a local guide for a magical night out in Bali. Depart from the hotel late this afternoon and transfer to the seaside temple of Pura Tanah Lot. Arrive just before sunset and find a quiet place to sit and contemplate the beauty of this sacred site. The guide will explain the seven sea temples of Bali and the history of 16th-century Tanah Lot. Then watch as the sun begins to set, casting beautiful colours upon the temple and the sea. Following this mystical sunset, it is time for dinner. Head to Tugu Bali for a dining experience like none other. Step into a hall filled with a vibrant mélange of exotic antiques, Indonesian art, textiles and more. Be seated at a table for a traditional Tugudom dinner, enjoying a lavish selection of imperial dishes from the Majapahit Palace era as well as authentic coastal cuisine. While savouring these exotic flavours, witness an incredible spectacle of theatre reflecting the royal parades of the King of Majapahit and his entourage. Having indulged the senses in the sights, sounds and tastes of Bali, return to the hotel for the evening.